What was it like to live in fear of jackbooted Nazi storm troopers marching down Milsom Street at any moment? How did it feel to be mercilessly bombed and machine-gunned during two nights of the Baedeker Blitz in 1942? What was it like to tour the devastated city streets the day after, the smell of burning still heavy in the air, and collect dead bodies for the city morgue? How did Bathonians cope with the blackout and the shortages of food and clothing? Where did they go for entertainment? What were their feelings about Yanks in the city? When did they come face to face with the enemy? How did they celebrate VE and VJ Days? At the outbreak of war, when the blackout went up and the sandbags were piled high, the tenor of life in Bath changed overnight. Men marched off to war, rationing was introduced and Bathonians steeled themselves for the long haul towards victory. 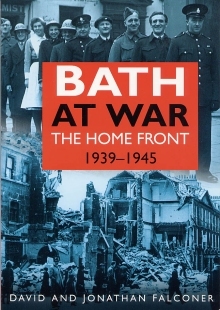 History tells us that in 1945 the Allies won the war and the Axis powers were defeated, but it forgot to say how the men, women and children of Bath who were left at home 'did their bit' for the war effort - Bath at War: The Home Front tells their story. This book includes personal memories and unpublished letters of more than fifty Bath people and many rare photographs. David Falconer was a Bathonian who, as a young boy, lived in the city during the Second World War and experienced the Baedeker Blitz at first hand. A retired schoolteacher, he lived in Trowbridge and also sang in Bath Abbey choir. He died in 2002. With his son, Jonathan, he is the co-author of Bath at War 1939-1945 and A Century of Bath (both Sutton Publishing, 1999). Jonathan Falconer is the author of more than fourteen books, mainly on aspects of aviation history, and co-author of this book, "Bath at War" and "A Century of Bath" with his father, David. He is a senior commissioning editor for a well-known history publisher and lives in Bradford-on-Avon. This book is available from many bookshops and by mail order. Otherwise, 7 copies are available from lending libraries in the Bath area, filed under 942.398; and the Bath Reference Library holds copies. The first description of the Bath Blitz was written soon after the event by Claude Wimhurst of the Bath & Wilts Chronicle and Herald. It was called "The Bombardment of Bath" (see entry below). The Bath Blitz then became a forgotten episode as ruined buildings were demolished or restored. Visitors came and went without any idea of what had happened to Bath during the Second World War. This book was originally written to preserve and publish the memories of the two most disastrous nights in the history of Bath, ensuring that they would not be forgotten. For several years it was the only publicly available history of those events. This 1975 edition sold out and is no longer available. On the 50th anniversary of the bombing, in 1992, HTV (the local television station) broadcast a documentary of the events, which the author wrote and presented. To accompany that broadcast, the book was updated with additional material and photographs, and reissued. This is the version pictured left. Martin Wainwright was a columnist for the Bath & West Evening Chronicle when he produced the 1st edition of his book. He is currently the Northern Editor of The Guardian, and retains the (mostly symbolic) title of Modern History Exhibitioner of Merton College, Oxford. The author donates profits from the sale of the book to hospital charities in Bath and Lübeck. The 50th Anniversary Edition of this book is available from several Bath outlets: the original one, The Oldfield Park Bookshop in Moorland Road, Bath, who have a good stock, and also Topping and Co and Mr B's. The author has been in touch asking for this entry to be updated. In order to assist anyone not in the Bath area to obtain a copy, he is now making them available by mail order, and details of how to contact him to obtain a copy are on his Blog. That Blog also contains more information on the content of the book than is given here. The 1st edition is available from lending libraries in the Bath area, filed under either 940.531 or "Adult Non-Fiction" in branch libraries; and in "Reserve" at Bath Central Library. But the 50th Anniversary edition is only avaialble for loan from the Weston (Bath) Library. 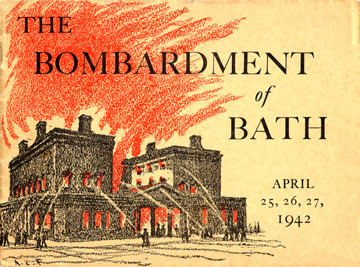 In April 1942, the Blitz came to Bath. High explosive bombs dropped by the bombers of Luftlotte III killed over 400 people, totally destroyed 329 houses and shops, wrecked another 700 so severely that they had to be demolished, and inflicted some degree of damage on many more. How did Bath cope? In this book, Niall Rothnie has woven the accounts of children, ARP wardens, soldiers on leave, policemen, ambulance drivers, doctors, housewives and many others, together with official statistics and German and British military reports, into a fascinating narrative. 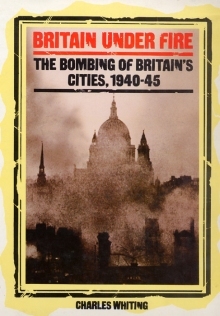 This book has fewer pictures but a wider ranging narrative than the other books on the blitz. At the time the first book was written, Niall Rothnie was the Head of History at Bath’s King Edward’s School. In 2009 when the re-issue was being written, he was a member of the Senior Managment Team at St Mary’s College, Crosby. The original book is out of print. Copies sometimes turn up in book fairs and second hand shops. Otherwise, copies of the first version are available from various libraries in Bath and surrounding areas, filed under 942.398. 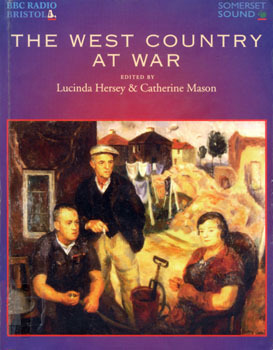 The newly issued (March 2010) edition is available from several bookshops in Bath, and copies of this later version are available on request from Bath Central Library. In October 2009, Naill Rothnie got in touch with Project members to inform us that Folly Books had obtained publication rights for his book, and he wanted to bring it up to date with details of significant events since his earlier version. The outcome of several e-mails and phone conversations is this re-issue, with an Editor's Introduction, additional photographs and a whole new chapter. Even for those who have read the earlier version, this one has photographs and historic details that have never before been published. This book started out as a history of the Bath Fire Brigade. But for most of its history, the Bath Fire Brigade was also responsible for the Ambulance Service, and thus it became necessary to extend the coverage (and the title) in order to reflect the full history. The early chapters cover the foundation of the brigade at the end of Queen Victoria's reign, and its development and expansion over the next 40 years. The middle of the book covers the preparations for the Second World War, the demands on the brigade's services during the bombing of Bath, and the lessons learned in the aftermath of those nights of devastation. This section will be of particular interest to those interested in the historical sections of this web site. 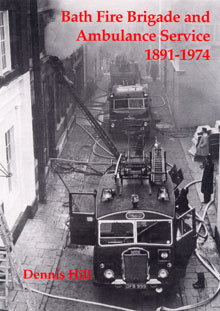 The final chapters cover the new appliances and equipment that came available in the 1950s and 1960s, and the final days of Bath Fire Brigade before it became part of the County of Avon Fire Brigade in 1974. Dennis Hill is a Bristolian by birth, but has worked in Bath for 20 years. In 1999, he completed a book on the Bristol Fire Brigade, and then turned his attention to this work, which was completed in 2003. This book is available in Bath from Waterstones in Milsom Street; Whitemans Book Shop in Orange Grove; and The Oldfield Park Bookshop in Moorland Road. Phone (+44)or(0) 117 986 5481. The mail order price is £16.00 + £2.00 P&P = £18.00. Reissued as a paperback in 1999, published by Leo Cooper. £12.95, 208pp. 235 x 169mm. "We will raze their cities to the ground" boasted Hitler in 1940. His threat made every man, woman and child in the United Kingdom a potential victim of sudden death from the skies; a risk that lasted from 7th September 1940 when the first bomb landed on London, until 29th March 1945 when the last bomb, a V1 flying bomb, landed on a sewage farm in Hertfordshire. This book tells the story the air raids and flying bombs from the point of view of these potential victims, both from official records and from eye-witness accounts. It paints a vivid picture of ordinary people in extraordinary circumstances. The book covers events throughout the country. The raids on Bath are described, but they occupy only three pages in the book. However, the author has recorded some memories of people who were not featured in other books. Too young to join up when the war started, Charles Whiting joined the army in 1943 and served in Belgium, Holland and Germany during the war. After the war, he became a university teacher until 1973 when he became a full time writer. He has written numerous books since then, both fiction (under the pen name Leo Kessler) and non-fiction (under his own name). Britain Under Fire was first published in 1986. The 1986 hardback edition of this book is out of print, but copies are sometimes found in second hand bookshops and at book fairs. Otherwise, 3 copies are available from libraries in the Bath area, filed under 950.544. The 1999 paperback edition is still available. Bookshops should be able to order it if it is not in stock, and it is listed by Amazon. 18 copies are held in libraries in Bristol and Somerset, filed under 950.542. 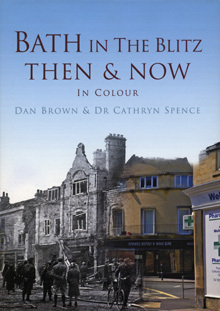 Published to coincide with the 70th anniversary of the Bath Blitz, this book combines photographic comparisons between the scene in 1942 and the same scene now for a number of locations around Bath, with a commentary on the social and architectural significance of each of these locations during that timesacle. This book is a memorial to the city's sufferings and the bravery of its residents and, whilst it celebrates the tireless efforts of the restorers of Bath's heritage, it also illustrates the many clues that remain to this devastating periods in Bath's history. Combining as it does the archive images from the Bath in Time collection and the work of a professional photographer and the informative and compelling text of a historian, this book will fascinate both residents and visitors alike. Dan Brown is a Bath resident, a professional photographer, and a keen collector of images of Bath and the surrounding areas which form the basis of his website www.bathintime.co.uk. Dr Cathryn Spence is a historian and museum professional as well as being a lecturer and undergraduate tutor, and she has published a number of books on Bath's history and architectural heritage. She and Dan Brown have collaborated on a number of projects over the last eight years. The book is widely available in a number of bookshops in Bath though it is too new a publication to be on Bath's library shelves yet. It is also available from Dan Brown's website shop and from Amazon for those who wish to buy by mail order. This booklet was produced by the Bath & Wilts Chronicle and Herald soon after the event, using photographs taken by the newspaper's photographers, and with words written by Claude Wimhurst, a member of the editorial staff. Because of the press censorship in 1942, this booklet was only made available to Bath residents, who could walk round the streets and see the scenes that had been photographed. The censors would not have allowed photographs of such extensive destruction to be seen elsewhere, so only a very limited number were printed. Little is known of Claude Wimhurst who wrote the text. The pictures in the booklet are simply attributed to "staff photographers". However, some of the photographs are in the Local Studies Collection in Bath Central Library, and most of these are attributed to Donald Stride. The cover design is attributed to Arthur C Fare. A copy has been recently donated to Moorland Road library and it can be found on the Local Interest shelf. I have never heard of a copy being offered for sale. 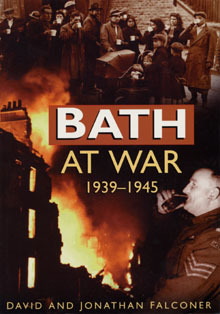 At the outbreak of the Second World War, the City of Bath was considered to be relatively safe from enemy attack. The Admiralty was evacuated from Whitehall to Bath in September 1939, along with thousands of evacuees from London and the south-east. Yet, in April 1942, Bath was subjected to two nights of murderous bombing by the German Luftwaffe that killed more than 400 inhabitants and destroyed thousands of historic buildings and peoples' homes. In common with other cities the length and breadth of Britain, Bath had received its baptism of fire and became a true city at war. No longer a quiet spa resort, its contribution to the war effort included designs for warships and midget submarines, the manufacture of aircraft components, guns for tanks and precision instruments for the RAF and the Royal Navy. Drawing on reports from wartime editions of The Bath Chronicle, the authors paint a vivid picture of life on the home front. They describe how Bath readied itself for war and prepared for its defence on land and in the air; the horror and the heroism in the Baedeker Blitz are remembered. Food, rationing, and war industry, entertainment and crime in wartime Bath are also recalled, as are the city's famous soldiers, sailors and airmen. The spirited VE and VJ-Day celebrations that gripped the city are reported, and the book concludes with a look at the legacy of the war. 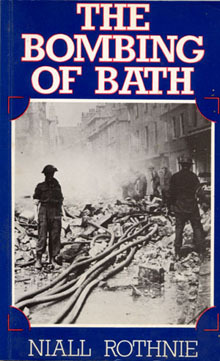 Whereas other books about Bath in the Second World War have concentrated solely on the Baedeker Blitz, Bath at War is unique in that it looks at the whole experience of war in the city from 1939 through to 1945, and how it affected the daily lives of its citizens. David Falconer is a Bathonian who lived in Bath during the Second World War and experienced the Baedeker Blitz at first hand. He was head of music at Oakfield Middle School, Frome, until his recent retirement. He died in 2002. Jonathan Falconer, his son, was born in Bath and is the author of ten books on aspects of aviation history, and one on the Victorian engineer Isambard Kingdom Brunel. He now lives in Bradford-on-Avon. When faced with the fairly ordinary question "What was it like in the war, Grandad? ", Ron Davis took the unusual step of asking 17 of his classmates from the class of 1947 at Bath Technical School to add their memories to his. 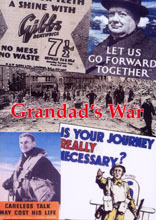 The result is this extraordinary book which looks at various aspects of wartime life from several individual viewpoints. This book was never put on general sale, and was mainly sold to friends and relatives, with a few copies given to schools and organisations, one of which is Bath Central Library. Ron Davis assembled the book and added the illustrations, but the real authors are those listed as Contributors in the introduction to the book. These would have been boys aged around 4 or 5 at the time war was declared, and 13 year olds when they joined the class of 1947. None had ever written a book before. To commemorate the 50th Anniversary of VE Day on 8th May 1995, BBC Radio Bristol broadcast a series of personal reminiscences by those who experienced the was in the West Country. The appeals on air for these stories in the weeks beforehand produced a wealth of personal war stories, and a book was produced to provide, as far as space permitted, a permanent record of such memories as well as the transmitted ones. This book is that record. The individual story-tellers are the authors, and the illustrations are theirs. The names on the cover are correctly described as editors. The cover illustration is a reproduction of a painting "Fire Guard at Weston-Super-Mare" by Barry Craig. I have not found any new copies in bookshops, but used copies are fairly easy to find on-line. 14 copies are available from libraries around Bath. 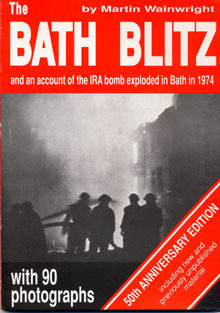 This book has only one chapter on the subject of the Bath Blitz. This chapter puts the raids are put into context of world events in a gentle and easily readable manner, and includes a few snippets which do not appear on this website yet. The remainder of the book covers a range of subjects from Bath's past, each chapter centred on a particular character or series of events. These have nothing to do with wartime Bath, but the book is a highly readable compendium of curiosities that will appeal to Bath's residents and visitors alike. Michael Raffael is an acclaimed food and travel writer who has been awarded a number of awards for his food and cookery works. 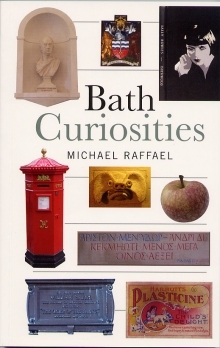 This book is a departure from his normal subjects, but Michael went to school in Bath and still lives in Somerset, so felt qualified to write about some quirky lives and unusual events in Bath's past. This book is only recently released (9th August 2006) and stockists are still being established. I have seen a copy in the window of The Oldfield Park Bookshop in Moorland Road, which is usually one of the first to stock local interest books. 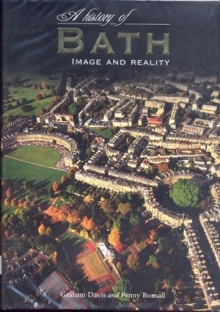 This book covers the history of Bath, from its origins to the beginning of 1996. 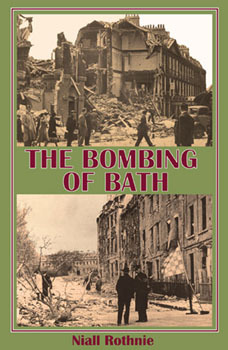 One chapter is about the 20th century, and included in that is a section on the Bath Blitz. (The author has kindly allowed me to reproduce a small part of it on this website). The approach taken in the book is to look at Bath's past from the perspective of its residents and visitors: where and how they lived, how they were employed, and the changing political climate through time. For anybody interested in social history, this is a valuable read. Professor Graham Davis was born in Cheltenham, grew up in Gloucester and has lived in and around Bath since 1968. He graduated from the University of Birmingham and completed his postgraduate studies at the University of Bath. He is now Professor of History at Bath Spa University. He has been the author or editor of a number of books and articles on Bath's history, and is currently working on a collection of essays entitled Bath Exposed! He has also written extensively on Irish migration. Dr Penny Bonsall was born in Bristol and grew up in north-west Somerset. She has lived in north-east Somerset for the past forty years and now lives near Peasedown St John. After graduating from Bath Spa University, she completed her postgraduate studies at the University of Warwick, and is now a freelance historical researcher with a special interest in the Bath region. This book is only recently released and I have not had information about stockists. However, I have seen a copy in the window of The Oldfield Park Bookshop in Moorland Road, and a copy in Bath Central Library. Most bookshops will be able to order it. In the summer of 1940, an invasion by the armies of the Third Reich seemed almost a certainty, and Somerset with its long coastline was an obvious target. While the obvious visible defences were constructed, covert defences were also being put in place. 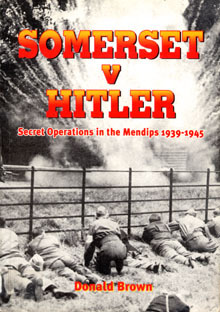 In this book are descriptions of Somerset's Auxiliary Units (or the British Resistance Organisation as the author introduces it) plus the creation of decoy targets and electronic wizardry to distort German navigational radio beams. The other largely unsung contributions to the war effort, the Women's Land Army and the Royal Observer Corps are also covered. Bath is given the occasion mention, but most of the book is concerned with the towns and villages south and west of Bath. Donald Brown is a retired Head Teacher who lives in Weston-Super-Mare. His book, published in 1999 gathers together the memories of those whose stories could finally be told after 50 years of secrecy. This is the 2nd edition of a book first published in 1943. 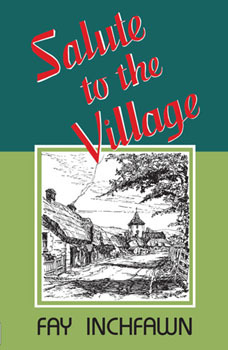 'Salute to the Village' is a first-hand account, written from the viewpoint of a moderately affluent middle-class family, of the impact of the Second World War upon the little village of Freshford just outside Bath. As in countless other villages at the outbreak of the Second World War, Freshford had to accommodate billeted personnel and evacuees during the privations of war. But Freshford's greatest test came in April 1942, when the bombing of Bath resulted in hundreds of bewildered evacuees - families bombed out of their homes or afraid to return to the city for fear of further bombardment - seeking refuge in the village, often sleeping in barns or under hedgerows. This is a true, eye-witness account of the wartime years by a highly esteemed author. Because it was published in wartime, place names are not used, and part of the enjoyment of the book is trying to identify what location is intended from the description used. Fay Inchfawn was the pen-name of Elizabeth Rebecca Daniels who was born in Portishead, near Bristol, in 1880. In 1914, shortly after her marriage to Atkinson Ward, she moved to Bradford-on-Avon in Wiltshire and pursued a literary career that saw her become one of the most prolific women writers of the inter-war years. In 1927 the Wards moved to an early Victorian villa in Freshford where she lived for the rest of her life. She died in 1978 at the age of 98 and is buried in the churchyard of St Mary's, Limpley Stoke. The first edition seems to be unobtainable, but the second edition is in Bath bookshops (I have seen a copy in the window of Oldfield Park Books in Moorland Road) and is shown on the Bath Library list, though copy availability had not been updated at the time of writing.